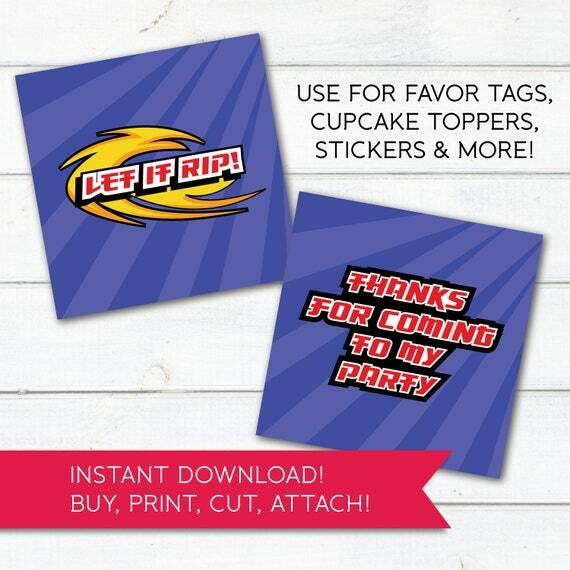 ★ THIS INSTANT DOWNLOAD, DIGITAL LISTING INCLUDES AN 8.5x11 PDF FILE with 2 designs that can be used to make party favor tags, stickers, cupcake toppers, for scrapbooking and whatever else you can think of! ★ No printed materials will be shipped! The designs are set up as 2.2" squares. Use scissors or paper cutter to trim along the edges, or you can use any shape 2" punch. The PDF file is 8.5x11" and is set up with 12 squares (6 of each design) per page, see the 2nd picture above. *Watermarks will not appear on the actual file you download. **Please note! Instant download files come AS IS! The price does not include customizations. If you would like me to personalize the file please message me through Etsy with your request and I will respond with a price. 1. READ!! — It's so important to read this entire description and view all the images above! Trust me, it's sure to help you in the long run! 2. PURCHASE — Add this item to your cart and complete checkout. 3. DOWNLOAD — Shortly after completing your purchase you will receive an email with a link to download your files. Check your spam/junk mail folder if you don’t see it in your Inbox. 4. PRINT — Open your PDF in Adobe Acrobat, Preview (on Mac), or any other program that is PDF compatible. Print onto WHITE card stock or sticker paper (8.5″ x 11″). You will get the best result printing on a laser printer. If the design is heavy on color we do not recommend using an ink jet as you will use A LOT of ink! Instead, send the file to an office supply store or print shop. 5. TRIM OUT THE TAGS — Use scissors, xacto and ruler, paper cutter, or a 2" punch, whatever you prefer. • This listing is for DIGITAL file only, no physical items will be shipped. • Due to the nature of digital downloads, ALL SALES ARE FINAL, NO REFUNDS. • You may print the files for yourself as many times as you need, however, you may not share the files with anyone. Resale or commercial use of any kind is not permitted. Please respect our work. Designs are ©lilygirlpaper. All rights reserved. Like the design but not ready to buy? Please ❤️ this listing, or Pin it for later! Thanks so much for visiting Lily Girl Paper! Personalized Party Favor Tag, Scavenger Hunt Favors, Tween Birthday Party, INSTANT DOWNLOAD, Editable!